Dr. Sherjeel Saulat FCPS (Urology) Fellow European Association of Pediatric Urology (FEAPU) U.K, Fellow Pediatric Urology (SIMS) Diploma Laparoscopic Urology (DLU), Strasbourg University, France. Dr. Sherjeel Saulat Consultant Urologist is currently working as Director Surgeries and HOD Urology Department at Tabba Kidney Institute Karachi. He did his MBBS from Rawalpindi Medical College, Rawalpindi, in 1996. After his graduation, he served at Holy Family Hospital, Rawalpindi, in the departments of Surgery and Medicine as House Officer. Dr. Sherjeel Saulat then joined Rawalpindi General Hospital, Rawalpindi as trainee for MRCS from 1998 to 1999. He also completed his Fellowship Training (FCPS) in the same hospital from 2000 to 2003 with special interest in reconstructive surgery and the topic of dissertation being related to stricture urethra. He acquired FCPS from CPSP in 2004 in the specialty of Urology. Dr. Sherjeel Saulat has acquired another International Diploma in Laparoscopic Urology (DLU) from IRCAD, University of Strasbourg, France, in June 2015. On completion of this course, he appeared its examination and successfully cleared it. He also cleared written and oral examination of Fellow of European Association of Pediatric Urology (FEAPU), U.K for the first time in Pakistan. Dr. Sherjeel Saulat joined Sindh Institute of Urology & Transplantation (SIUT) as a Senior Registrar in the Department of Pediatric Urology in 2005. He actively participated in all the teaching activities in the hospital and also his individual growth as a Pediatric Urologist took place. Under the Herculean guidance and efforts of Mr. Philip G. Ransley and international faculty of pediatric urologists, he soon became one of the vital members of the team and made remarkable contributions in the phenomenal growth of the pediatric urology department at SIUT and which has impacted on the growth of this essential specialty in the country. He served there for the next 10 years and was designated as Lecturer, Senior Lecturer and later promoted to Assistant Professor in the Philip G. Ransley Department of Pediatric Urology at SIUT, Karachi, Pakistan. During this period he worked with the likes of Ms H.K.Dhillon, Prof. Ricardo Gonzalez, Mr. Gianantonio (Tony) Manzoni President ESPU, Mr. Padraig (Pat) Malone, Dr. Alaa El Ghoneimi and Dr. Imran Mushtaq, a world renowned pediatric laparoscopic urologist. Dr. Sherjeel Saulat has special interests in reconstructive, endourological and laparoscopic procedures in Pediatric Urology. In this connection he has attended many courses at international centers of repute including United Kingdom, Italy, Switzerland and Turkey. He has acquired another International Fellowship in Pediatric Urology from Sindh Institute of Medical Sciences (SIMS) SIUT, in March 2012 under the mentorship of Philip G. Ransley and Prof. Adeeb ul Hasan Rizvi. He is well known for his expertise in stone surgery and a master trainer for PCNLs and URS lasertripsy both in children and adults and has trained local as well as foreign urologists in this subspecialty as an Urolithiologist. He is the pioneer of laparoscopic pyeloplasty in Pakistan. He is also doing laparoscopic Nephrectomies, laparoscopic Orchidopexies & laparoscopic varicocelectomies in both pediatric & adult patients. He also deals expertly in all adult urological procedures as well with special interest in all adult urological malignancies open and laparoscopic procedures of bladder, prostate and renal tumors that includes laparoscopic radical cystoctomy with ileal conduit, prostactomy and nephrectomy. He also performs bipolar TURP, HOLEP and TURBT procedures. He has contributed both scientifically and surgically to the emergence of pediatric urology as a recognized subspecialty in the country. He has many publications to his credit in both national and international indexed journals. He has a Research Paper for Pediatric fellowship titled “Management of vesicoureteric reflux with dextranomer Hyaluronic acid copolymer (Deflux) in Pakistan”. He has numerous posters and oral presentations in his credit. He is Associate Editor for Frontiers Journal in Pediatric urology and Review Editor in African Journal of Urology. He reviewed many international and national papers in this context. 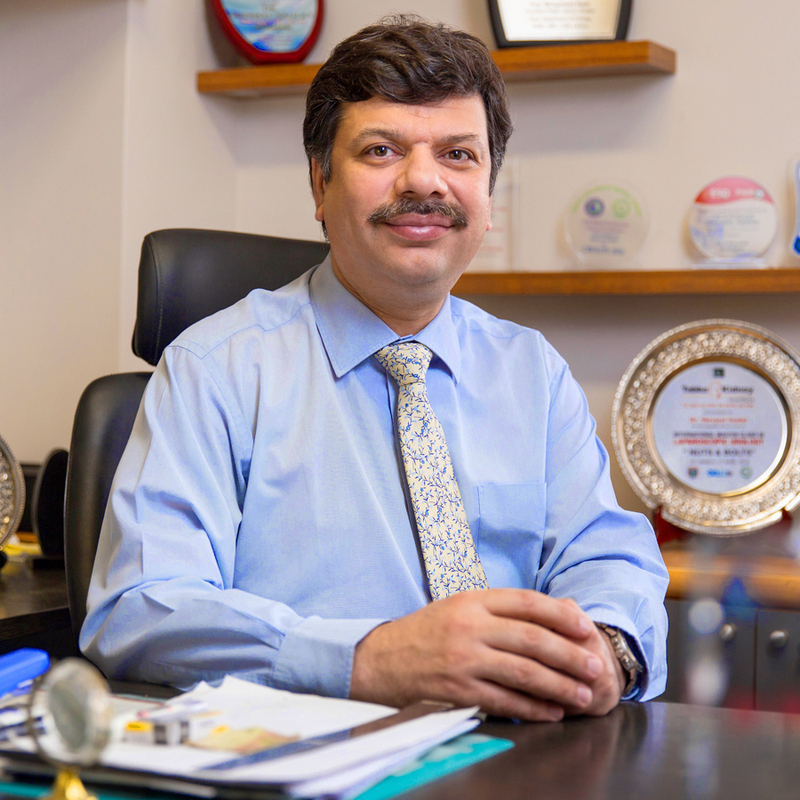 He is member of various national and international organizations including European Society of Pediatric Urology (ESPU), Active Member of European Association of Urology (EAU), Middle East Society for Organ Transplantation (MESOT), Board Member of The International Alliance of Urolithiasis (IAU), The Transplantation Society (TTS), Transplantation Society of Pakistan (TSP), Society International Urology (SIU) and Pakistan Association of Urological Surgeons (PAUS).